Impact of El Niño phenomenon on the infrastructure of water and sewerage systems. The experience of Ecuador in 1997-1998 (PAHO, 2003)During 1997-1998, El Niño -the cyclic warming of water in the central and eastern portions of the Pacific ocean that produces strong precipitations in Ecuador and the North of Peru and Chile- showed its strongest manifestation. The most affected provinces of Ecuador were Manabí, Esmeraldas, and Guayas, in the Coast, remaining partially isolated from the rest of the country. Their economy was seriously affected and the standard of living of its inhabitants declined radically. Besides deaths, diseases, and environmental impacts, the water and sewerage infrastructure and services were also seriously affected. 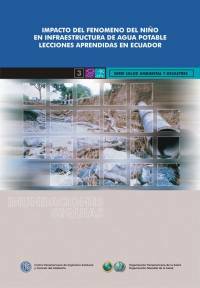 This volume presents a general diagnosis of the effects in some drinking water and sewerage systems of Manabí and Esmeraldas. It also provides suggestions and solutions to mitigate and prevent the effects of the phenomenon in the future. This title can be used as a useful reference for other countries of the Region that are affected by El Niño or by similar events.